May we extend a personal invitation to you to attend Foothill Baptist Church? You will find Christ centered services where the Bible is taught in a practical way to meet the needs of your life. Our church is committed to building strong families and has an emphasis on reaching souls for Jesus Christ. It is our desire that you will find a genuine warmth and friendliness at our church. If you are in the area may we encourage you to come visit us? Here at Foothill we are pleased to be known as a Baptist Church. Our desire is to continue: Preaching the Word of God, the Gospel of salvation by faith, Singing the hymns and Gospel songs, Seeking to win the lost with a soul-winning zeal, Separated unto the Lord Jesus Christ, personally and ecclesiastically in the Biblically manner, Loving and caring for each other. With all the activities in the Bay Area, there is still one crying need in the heart of every individual: “Where will I Spend Eternity?” We are available to help you in any spiritual matter that you may have. Foothill Baptist Church was founded in May 1889 as the Twenty-third Avenue Baptist Church in Oakland. It later moved to Foothill Blvd. in Oakland and became known as Foothill Blvd. Baptist Church. Many years later it merged with Trinity Baptist Church in Castro Valley (planted by Foothill Baptist Church) and retained the name, "Foothill". Lord willing, in May 2019 our Church will celebrate the 130th anniversary. Dr. George Motoc prefers to be known as “Pastor George” or simply “George”. He is a native Romanian and has 29 years of pastoral experience. After 13 years of pastorate in Romania, he was elected in 2003 as Pastor of Faith Romanian Baptist Church in Hayward, California. 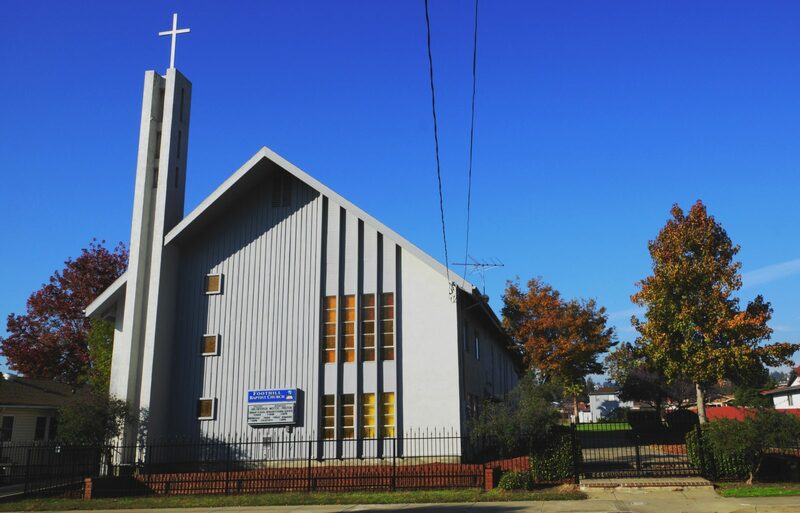 By the end of April 2008, members of Faith Romanian Baptist Church voted to merge with Foothill Baptist Church in Castro Valley where George serves as Senior Pastor. George grew up in a ministry home. His Grandfather was a Minister of the Gospel for 50 years and his Father being involved in music ministry and preaching. Concerning education, George graduated with Bachelor of Science in Mechanical Engineering at Polytechnic University in Bucharest, Romania, Master of Divinity at Central Baptist Theological Seminary, (Minneapolis, MN) and Doctor of Ministry at International Baptist College and Seminary, Tempe/Chandler (AZ).